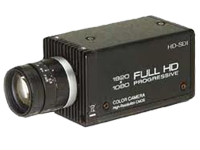 Toshiba's revolutionary 1080i CMOS Colour Camera IK-HR1S delivers true hi-definition, progressive-scan images in 16:9 format with HD-SDI output from ultra compact body. The IK-HR1D camera imagery shows little or no motion artifacts, offers different shutter modes, adjustable gamma, auto and manual white balance and all this in ultra compact and lightweight housing. While the IK-HR1D connects easily and directly to monitors via DVI or HDMI, the IK-HR1S offers very long cable lengths thanks to HD-SDI and the IK-HR2D adds USB capability especially suited for application in scientific imaging and microscopy. The IK-HR1 single piece cameras measure mere 44mm x 44mm x 78mm and weigh 146 g whereas the remote camera head IK-HR1H measures 30mm x 35mm x 36mm and weigh 48 g.